I received a brand new Dovo Shavette today. It was my first Shavette, so with great honor I unboxed the package and found a small plastic packaging with a very stylish Shavette Razor inside. My first impression was that is was very light. It is made from aluminium and I have learned that professional barbers want pretty light tools since they are using them all day long. Too heavy equipment could make them tired faster. The aluminium finish makes the Shavette look very professional. I get that some of you like the old style of straight razors, but this is definitely more stylish than a normal safety razor. The Shavette comes with two blades (basically one blade that you break into two pieces) and two different blade holders. I went for the long holder that is designed for the longer blades. I was struck by how sharp a Shavette really is. If you are not careful you could easily cut yourself on your first try. For comparison I shaved half my face with the Shavette and half of it with a Gillette Fusion Safety Razor. The latter is probably one of the best safety razors on the market today. The safety razor is easier to use, of course. But the the difference in result was noticeable. The shavette left nothing, but I could still feel the beard where the Gillette razor had been. Since I am not used to the Shavette it took a long time to get the shaving done. I was probably too careful, but i still managed to cut myself just a little bit. Luckily I ordered a small Alum stick that stops the bleeding with in seconds and I never felt any pain since the Shavette was so sharp. No marks left now either. The Dovo Shavette looks good, it is pretty easy to change blades, and is easy to hold when shaving. That means I think it is a good thing to try if you want to shave like the pros do. 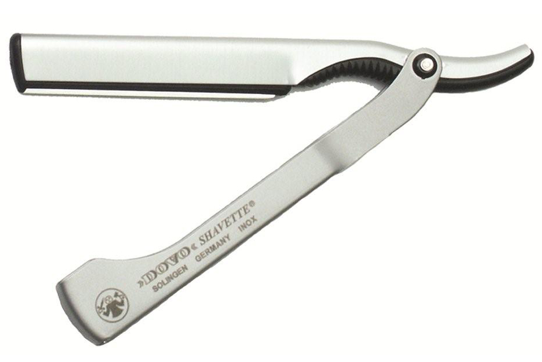 For a quick shave in the morning I will probably still use the Gillette razor, but whenever I have the time or need a really good shave (for the ladies) I will definitely use the Shavette. I just need to get better on how to use it. This was sent to us by Bob Sylvester, thanks Bob! Please leave a comment if you want to send us a review and we will publish it here on the site.